E xtra spooky fun was had at The Rec Room this past Tuesday, with Trivia Club being brought to you for some Halloween night fright fun! Yes, on this Halloween week for Trivia Club it was all kinds of not actually Zombie Wrestling wackiness that brought together new and excited teams and a few returning favorite! Trivia Classic ended with Bone2win in the lead, with two points on Oh Shoot!, though both teams took the same amount of points from Trivia Royale! In third place were the birthday party, FRAK, while in fourth were Cailíní Deasa! 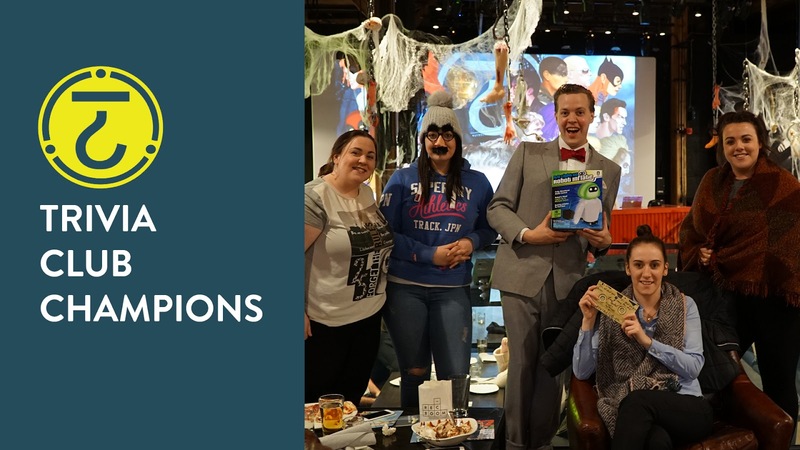 Deasa were bolstered by a productive Royale, making up for the fact that they had only been able to enter at the 6th question of Trivia Classic! Rounding out the field were Perennial Students! Tonight was also the first night at The Rec Room, and of Trivia Club, were Game Show Games became a part of Trivia Classic, making for one super-sized thirteen question first round! Tri-Pardo was now our second round, with these three questions having all the more stakes put in them! The first category chosen by Perennial Students was rolled for nineteen points, a tradition at The Rec Room! The second category was chosen by Bone2win and ALSO rolled for nineteen points! Over eight events, 19 has now been rolled TEN TIMES! Cailíní Deasa rolled third, making our last category of round two worth fifteen points! This put fifty-three points up for grabs in Tri-Pardo! The two nineteen point questions proved tricky however, as Bone2win lost nineteen points on the second category, while Cailíní Deasa did as well, though luckily gaining nineteen points on first category and another fifteen points on the third category! Finally, FRAK lost nineteen points on the first category, but regained that nineteen on the second and grabbed another fifteen points on the third category! This meant that as we rounded into the third and final round, our Trivia Finale , it was FRAK with a three and a half points lead on their nearest competition Cailíní Deasa while our regulars at The Rec Room, Oh Shoot! were ten points off the lead! Oh Shoot! left six points on the board with the wager, while Bone2win looked to regain their initial lead by going all-in! Also going all-in were Cailíní Deasa, while FRAK held off and looks to play the longer game with a twenty point wager! Winning their FIRST GOLDEN VHS CHAMPIONSHIP, even after entering half-way through the first round and also becoming the first Champs to be playing from the balcony in The Hall, CAILINI DEASA! Bone2win finished as runners-up on the night. Congrats once more to Cailíní Deasa, who join Oh Shoot! as first-time Golden VHS winners at The Rec Room! Thank you to everyone who came out to compete at this Halloweeeeeen edition of Trivia Club! We'll see you all again NEXT TUESDAY at The Rec Room with a reminder that we won't be in The Hall, but instead will have Trivia Club in the upper-level of the Three10 restaurant (right before you get to The Hall) and it will be sponsored on the night by Fox Searchlight's TIFF People's Choice winning film, Three Billboards Outside Ebbing, Missouri! You'll have the chance to win tickets, t-shirts and trucker hats for this incredible film!